Photo: 2018 UW Business Plan Competition Grand Prize winners A-Alpha Bio. Courtesy of UW Foster School of Business | Buerk Center for Entrepreneurship. Three UW Bioengineering-affiliated teams won top prizes and $32,500 of startup funding at the 2018 UW Business Plan Competition (BPC), held May 24. Among the winning teams from BioE was the $25,000 Herbert B. Jones Foundation grand prize awardee, A-Alpha Bio. The UW Business Plan Competition (BPC), hosted by the UW Foster School of Business’ Buerk Center for Entrepreneurship, provides student-led teams with mentoring and feedback, exposure to angel investors, venture capitalists, and BPC alumni from the Seattle area, and the opportunity to show that their business idea can make it in the real world. Now completing its 21st anniversary, this year’s competition featured teams from 12 colleges and universities around the state. More than 200 judge screened the 82 teams that entered this year’s competition, and chose 36 to advance to the Investment Round, where the Big Picture and Best Idea prize winners were selected. The top 4 prizes were awarded to teams who advanced through two more rounds of the competition. 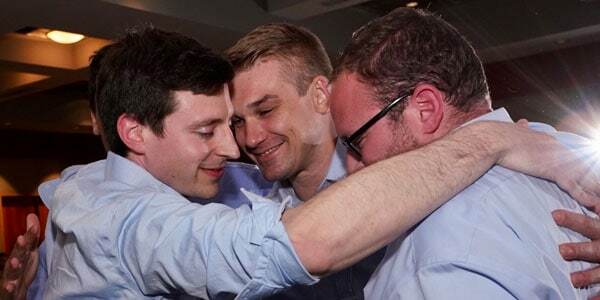 Over the past two decades, the UW BPC has awarded more than $1.3 million dollars in seed funding to 167 teams, more of a hundred of which are still going strong today. The A-Alpha Bio team aims to provide a comprehensive, cost-effective drug screening platform to pharmaceutical companies. Currently, drugs can only be screened for one possible protein interaction at a time, which is time and resource-intensive. A-Alpha Bio’s technology, AlphaSeq, offers a novel solution that enables a drug to be screened for thousands of possible interactions before it enters clinical trials. The rapid, efficient technology could help bring safer drugs to market more quickly at a lower research and development cost. 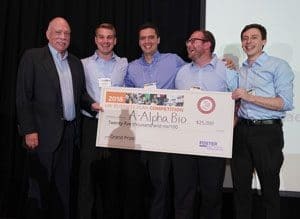 A-Alpha Bio won the $15,000 Hollomon Family grand prize at this year’s Hollomon Health Innovation Challenge, and in 2017, received the UW BPC’s Perkins Coie $2,500 “Best Innovation/Technology Idea” prize. The Nanodropper is an affordable, universal eyedropper adapter that decreases the volume of oversized eyedrops. By being able to deliver precise doses of eye medications, the Nanodropper aims to reduce cost, waste and side effects, ultimately increasing access to expensive prescription eye medications. 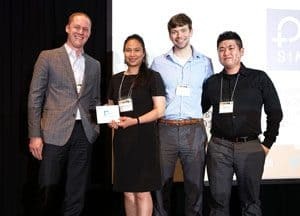 The Nanodropper team also had a strong finish at this year’s Hollomon Health Innovation Challenge, winning one of three $1,000 “Judges Really Liked” prizes. Team members: Nuttada Panpradist, Joshua Buser, Annapurni Siram and David McIntyre (BioE); Rahil Jain (Electrical Engineering); Blythe Adamson (Pharmaceutical Science); Richard Lee (Pharmacy). OLA Simple strives to be a global leader in cost-effective, rapid, point-of-care platform technologies to detect single nucleotide mutations in DNA or RNA and revolutionize the diagnostics, predictive outcomes and therapy for acquired and inherited diseases. It is designed to be fast, affordable and simple to use, and accessible to low-resource settings where sophisticated and expensive lab tests are out of reach. 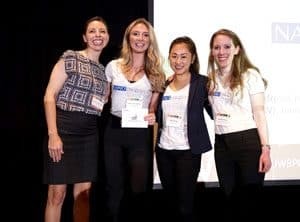 OLA Simple rounds out the BPC winners that also took home top prizes at this year’s Hollomon Health Innovation Challenge, winning the $10,000 Herbert B. Jones Foundation second place prize.